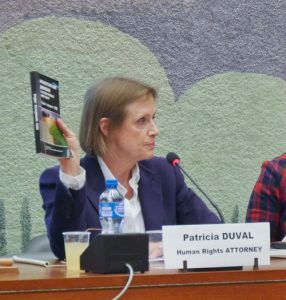 The 14th May 2018, on the occasion of the 30th session of the Universal Periodic Review at the United Nations (Geneva), the french NGO with United Nations Consultative Status, the Coordination of the Associations and the People for Freedom of Conscience (CAP LC) organised an event on the topic the Russian Federation and Religious Freedom . It was focused on the activities on the anti-cult organisations in the Russian Federation and the consequences on religious freedom. Mister Peter Zoehrer, General Director of the Forum for Religious Freedom Europe. FOREF Europe is an independent, secular, civil society formation dedicated to defending the freedom of religion in accordance with international law. He highlighted the European roots of the FECRIS and its funding by French government. He exposed the armful activities of the FECRIS in Austria to illustrate the “modus operandi” of such anti-cult association. He explained how this model was duplicated in Russia with the propaganda of the vice-president of the FECRIS M. Dvorkin and that was at the origin of the deterioration of the Religious Freedom in Russia. The consequences of this propaganda were dramatic since they initiated raids and arrests of religious minorities’ members throughout the territory and this constantly increasing. 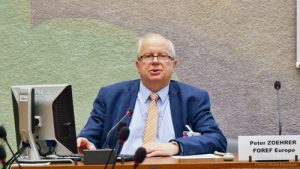 In spite of its public financing by the French secular Republic, FECRIS has a Russian Vice-President, Alexander Dvorkin, who belongs to the Russian Orthodox Church and “fights” against targeted religious minorities he sees as competitors to the Orthodox faith. He is the most infamous anti-sect activist in Russia and the Commonwealth of the Independent States (CIS). His militant activities are relying on the Spiritual Security concept, as defined by the Putin administration in 2000. 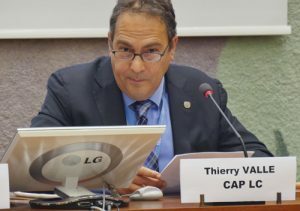 The FECRIS Vice-President has been engaged in hate speech and disparagement against so-called “sects” for over twenty years, accusing religious minorities of being “foreign agents” acting as enemies to Russia. Dvorkin has fueled suspicion and prejudice against the Mormons, Hare Krishna devotees, New Pentecostals, Falun Gong members, Jehovah’s Witnesses, Scientologists and others, leading to repression such as banning, imprisonment and incitement of hatred that leads to physical violence, threats, vandalism and similar aggression. Dvorkin is also President of the Saint Ireneus of Lyons Centre for Religious Studies, the FECRIS member association in Russia. On the advice of this anti-sect network, families who disagree with the choice of one of their relatives to adhere to a non-traditional religion take them to so-called “rehabilitation centres” held by Orthodox priests where these followers of minority religions are induced under pressure to recant their faith and return to the Orthodox fold. This approach recalls the criticized “deprogramming” which has been found to be illegal and to violate followers’ right to freedom of religion or belief: “No one shall be subject to coercion which would impair his freedom to have or to adopt a religion or belief of his choice” pursuant to Article 18.2 of the International Covenant on Civil and Political Rights. This right is also protected under the European Convention on Human Rights. Some participants of the battle against so-called “cults” hold degrees recognized in Russia, and work in respected educational institutions. Moreover, they have the power to directly influence the state officials’ decisions about religious organizations, because some of them are the member of public councils at the various state agencies. Most of them assess religious movements from the point of view of the Russian Orthodox Church and translate the positions of the Russian Orthodox Church regarding new religious movements. Sometimes they write expert opinions in court proceedings related to religious organizations. There are cases when on the basis of such expert opinions religious organizations were liquidated. These experts act based on both ideological and capital interests, but have a single goal: to explain to the public that followers of certain faiths are dangerous, and that “spiritual safety” is worth the sacrifice of constitutional principles. “Dvorkin has been spearheading the campaign against Hinduism since the Bhagavad-Gita case seven years ago and the attacks on Shri Prakash Ji are aimed at reducing the popularity of Hinduism in Russia in order to achieve a monopoly state for the Russian Orthodox Church. 9) Demands towards UN and the International community. 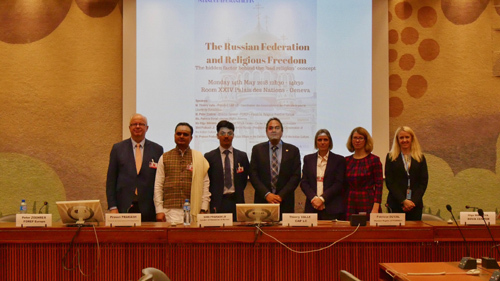 Initiating an intergovernmental study and investigation into the religious freedom in Russia that would result in the formation of a detailed document or report. 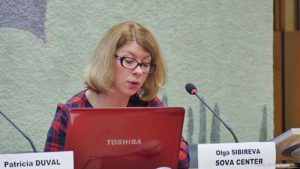 The topic of religious freedom in Russia goes hand in hand with many other burning issues that come out from the vast expanses of the country. Conducting more and more sessions of the sort where the victims can speak out and organizing the material gathered from such meetings into separate documents and reports. Beginning of a judicial process outside Russia concerning our plight and struggle with the rigid system where the people from the church dominate everything. 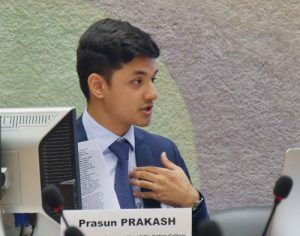 Help Shri Prakash Ji organize more meetings with people of responsibility and power whose agenda is on total accordance with the agenda of the United Nations and who could be of help for many other innocent victims. Pressurizing the governments of both India and Russia to finally move on to the final stages and stop the further negative development and deterioration of the problem. In this case the UN must regulate the dialogue between two countries. Forming if necessary a separate commission or department that would deal with problems of religious freedom in Russia and maintaining regular members in it. 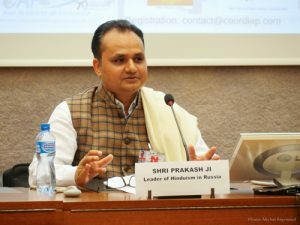 Accrediting “Shri Prakash Dham” with the United Nations so that Dvorkin’s organization thinks twice before attacking Shri Prakash Ji.